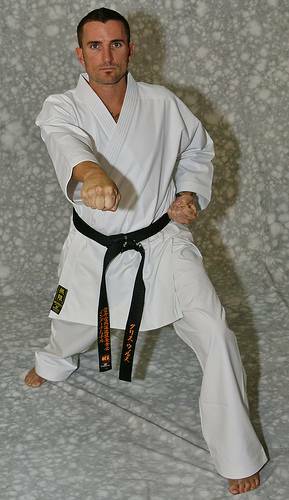 MUGEN Black Label (white karate uniform/gi).. 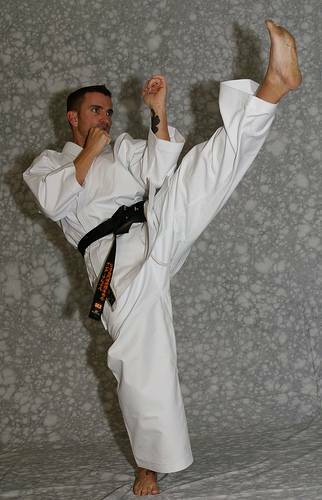 Compared to Mugen Orange Label, this uniform is slightly heavier which is made of 100% Cotton 12 oz. Brushed Canvas. Made from the finest Snow White Brushed Canvas, this uniform is an ideal uniform for top competitors who are looking for agility and maximum comfort. 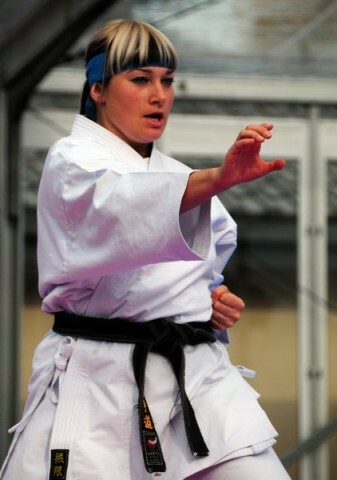 This is also a very popular uniform among top European fighters competing in kata and kumite. 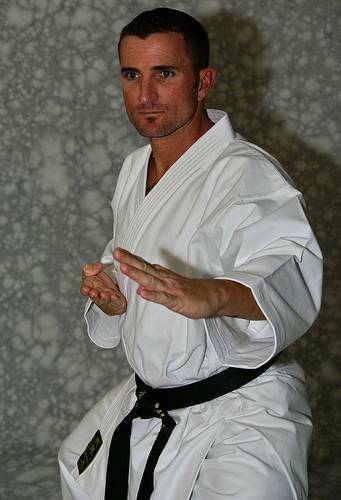 This uniform is comparable to the Japanese Toyo Karate uniform which the cuts are made with shorter sleeve, longer jacket, and shorter pants so that you don’t need any tailoring. KI’s high quality yarns are used for reinforcement stitching on the jacket and pants to offer strength and durability. Very comfortable, breathable fabric. Roomy, loose cut for smoother motion. 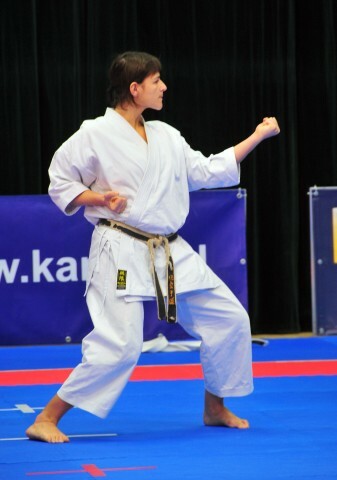 An ideal Karate uniform for advanced practitioners and top competitors. 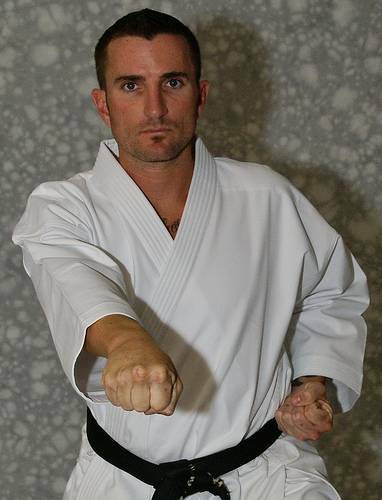 This uniform is also used by many Okinawa style dojos including Shotokan, Shitoryu, Gojuryu, and Wadoryu. 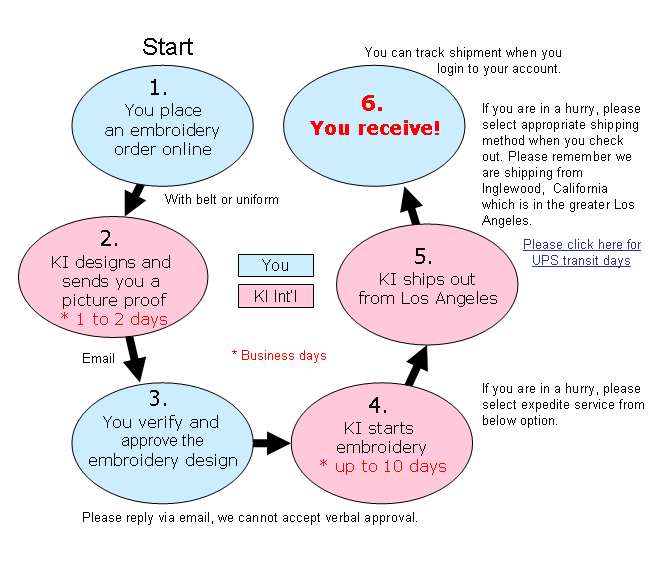 Chest Embroidery No chest embroidery My own text (+$24.95) Budo (武道) (+$22.95) Budoka (武道家) (+$22.95) Budoku Kai (武徳会) (+$22.95) Bushido (武士道) (+$22.95) Dai Nippon Butokukai (大日本武德会) (+$22.95) GoJyu Ryu (剛柔流) (+$22.95) Isshin Ryu Karate (一心流空手) (+$22.95) Karate (空手) (+$22.95) Karatedo (空手道) (+$22.95) Kenpo （拳法） (+$22.95) KyoKusSin Kan (極真館) (+$22.95) Mugen (無限) (+$22.95) Mu Karate Do (無空手道) (+$22.95) Nihon Karate Kyokai (日本空手協会) (+$22.95) Okinawa GoJyu Ryu (沖縄剛柔流) (+$22.95) RenBu Kai (錬武会) (+$22.95) SeiDo Kai Kan (正道会館) (+$22.95) SeiShin Ryu (清心流) (+$22.95) ShiDo Kan (士道館) (+$22.95) ShiToh Ryu (糸東流) (+$22.95) ShiToh Ryu Karate (糸東流空手) (+$22.95) ShinBu Kai (真武会) (+$22.95) ShoRin Ryu (小林流) (+$22.95) ShoRin Ryu (松林流) (+$22.95) ShoRinJi KemPou (少林寺拳法) (+$22.95) ShoRinJi Ryu (少林寺流) (+$22.95) ShoTou Kan (松涛館) (+$22.95) UeChi Ryu (上地流) (+$22.95) WaDo Ryu (和道流) (+$22.95) YoShu Kai (養秀会) (+$22.95) * All are in Japanese Kanji.